YEE HAW!! We went to the Rustler's Rooste to celebrate my mom's birthday. The place reminds me so much of the old Trail Dust restaurant in Dallas. 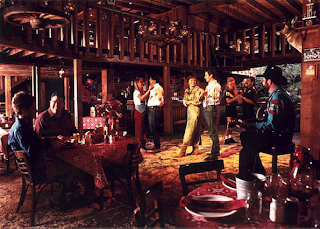 They have a country western band, a slide down to the dance floor and all the food is served family style. We had a blast! The kids must have gone down the slide a hundred times. My sister and I went down the slide and flashed everyone. The slide was fast and dumped you right in front of the main dining room. Kathy got rug burn on her bum! In annoying Kris fashion, I dragged every person I could to the dance floor. I couldn't exactly remember how to do the two-step, but I did my best teaching everyone what I remembered. It was like I was back at TCU and dancing in the Fort Worth Stockyards again. As I'm trying to remember the two-step I realized TCU was a long time ago!! Anyhow, we had an awesome time. The view from the restaurant was really nice. The food was pretty darn good and where else can you get cotton candy and a giant eclair on your birthday - that serves 20? Today all the girls are going to a local dinner theatre for the matinee performance of High School Musical. I can't wait to see Troy and Gabriella.